Martha Magenta: Enjoy A Vegan Barbecue Extravaganza! Enjoy A Vegan Barbecue Extravaganza! Want to make sure your vegan barbeque goes off without a hitch? 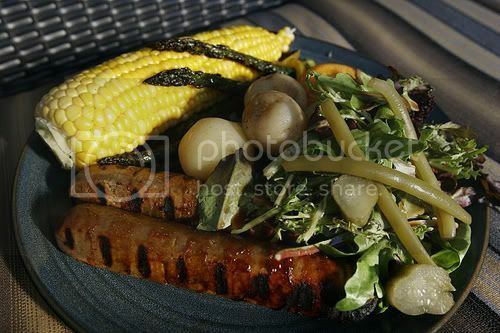 Read these quick tips and "how tos" for vegan barbecuing! If you use pre-made veggie burgers or veggie dogs, check the label to make sure that they are suitable for grilling. Clean your grill as you normally would. Once your grill is clean and cooled, take a paper towel dipped in oil and rub it throughly across the grates. Alternatively, spray your grill with a non-stick cooking spray. Now you're ready to grill. 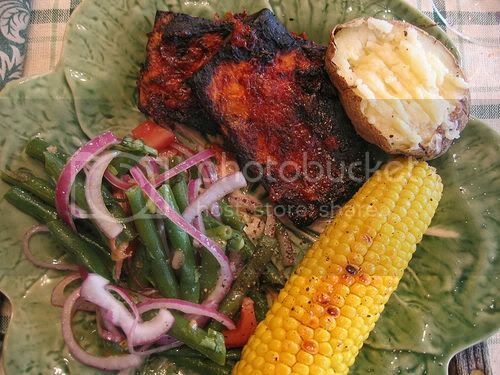 Just because its a barbeque, doesn't mean all the food has to be on the grill! Add grilled veggies to a green salad, or grill some pineapple for a pineapple and banana ice cream split. Or toss your grilled veggies with pre-cooked pasta for a main dish or serve inside of scooped out French bread with some soy or non-dairy cheese for a grilled veggie sandwich. For grilling make sure the tofu is extra-firm and well pressed. Tofu works well on a skewer, along with smaller veggies such as Brussels sprouts and mushrooms. 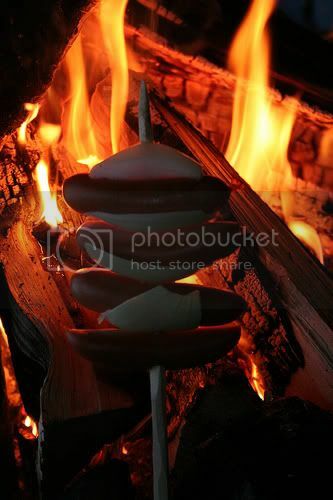 Turn the skewers frequently to cook evenly. You might also want to learn more about how to grill tofu. 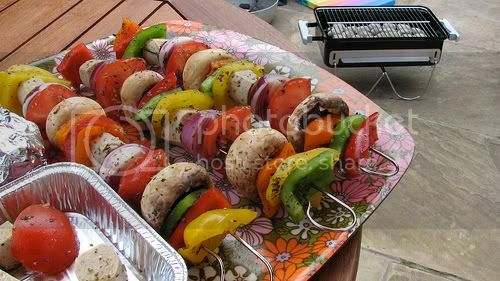 Place the seitan, onions, peppers, tomatoes, and mushrooms on the barbecue skewers. In a shallow baking dish or large ziplock bag, combine together the olive oil, sesame oil, curry powder, salt and garlic. Marinate the skewered vegetable kebabs for at least 2 hours (longer is fine). Grill for about 5 minutes on each side, or until done. By Kathy - Happy Healthy Life - serves two. 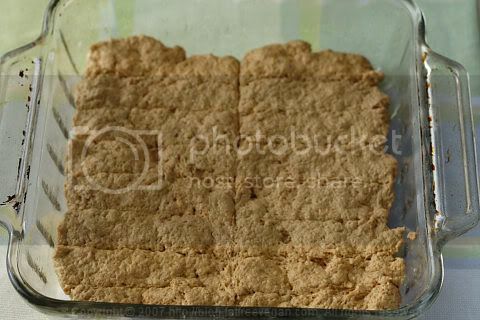 2-4 vegan cheese slice singles, (I only used 2 slices, but you can use more.) Rice vegan singles are my favorite cheese option. Cut off Brussels sprout ends. Remove loose or wilted leaves. Wash and slice potatoes into 3/4 inch long cubes. Slice off long stems of dill herb bunch. Chop dill coarsely. Squeeze one tangerine and rough chop the other. Add oil and potatoes to pan. Char all sides of the potatoes. Add in Brussels sprouts, onions, agave and half of tangerine juice. 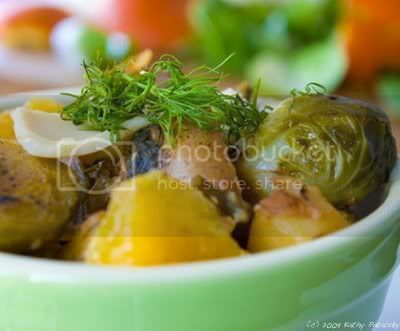 Char surface of Brussels sprouts. Add in broth, mustard, vinegar, pepper, salt, garlic powder and half of the dill. Reduce heat and cover pan with lid. Allow to cook for about 5 minutes. Shake pan every so often. Test doneness by inserting fork into potato. When the veggies seem tender remove from pan into large mixing bowl. Add vegan cheese slices and toss well. Heat will melt cheese. Add in the chopped tangerine, remaining fresh dill and 2 Tbsp lemon juice. Garnish with a cheese slice and fresh dill. Process all ingredients except the seitan in a blender or food processor until smooth. Transfer the mixture to a bowl and add the seitan. Stir to coat the seitan well. 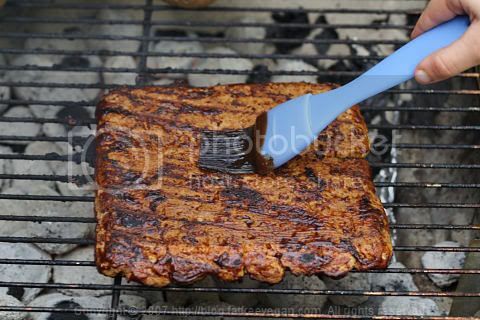 Skewer the seitan pieces and grill until browned, basting with any leftover sauce. Preheat the oven to 350 and lightly spray an 8x8 baking dish with olive oil. Mix the first 5 ingredients together in a large bowl. Mix the water with the nut butter, Liquid Smoke, and soy sauce and add it to the dry ingredients. Stir to mix well and then knead lightly in the bowl for a couple of minutes. Watch it closely to make sure that it doesn't burn. When it's sufficiently brown on one side, turn over and cook the other side, adding more sauce, if necessary. When done, remove to a platter and cut or pull apart the individual ribs to serve. Take your cute little coconut and, with a hammer and nail, pound a couple of holes in its indentations. Drain and reserve the liquid that comes out. Now smash the heck out the coconut - this is much more fun when done outside in one's bathing suit with sunglasses as protective eyewear. Pry the coconut meat out of the shell with a flathead screwdriver or similar - Keep doing this until you've hurt yourself and have to stop OR until you've got 2/3 of the meat out of the shell. Now for the REALLY tedious part: using a paring knife, remove the last of the brown skin from the outside of the coconut meat - you want your coconut to blend up the color of a white sand Caribbean beach, not look all brown and junky like Rockaway. Put your coconut meat in a blender and whip it up as much as possible, using the reserved coconut juice as liquid to facilitate the blending. *You can totally skip this whole step and use a can of coconut cream instead. Now, take your pineapple and whack off the frilly top - Same to the bottom, minus the frilly- sheering down the sides with your knife, slice off all the skin. Cut the naked pineapple in half lengthwise and then in half again so you have 4 long thin pieces. Core the pineapple by cutting away the "V" portion of each of the 4 pieces, then dice up the pineapple. 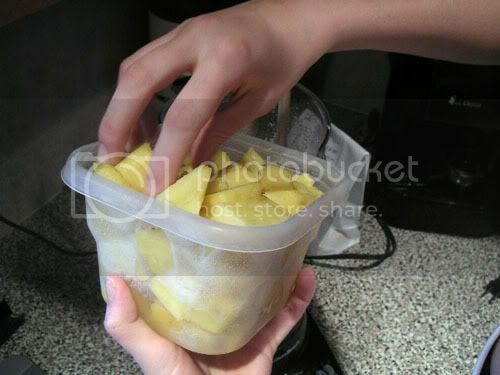 Add the diced pineapple and a good cup of rum or juice to the blender, along with the lime and salt. You can add some honey if your pineapple isn't particularly ripe or if you like things sweet. Grill your tofu in a tangy Asian hoisin-based sauce for an unusual barbecued tofu recipe. Perfect for your vegan barbecue. It's always best to let the tofu marinade in the sauce for several hours before grilling, so prepare in advance - even the night before your barbecue! Carefully slice tofu into 1-inch thick cubes or strips. If you're using skewers, cubes are best, but if you'll be placing your tofu directly on your grill, larger strips are better. Whisk together all the ingredients, except tofu, and place in a shallow dish. Place the tofu in the dish and spoon some of the marinate on top of the tofu. Allow the tofu to marinade for at least one hour, turning once or spooning more marinade over the top. You can also use a zip-lock bag instead of a dish. Lightly grease your gill and cook tofu over medium flame for 6-7 minutes on each side, basting with extra marinade. Whisk together the barbecue sauce, sugar, chili powder, pepper and orange juice over medium low heat until well combined, about 3 minutes. 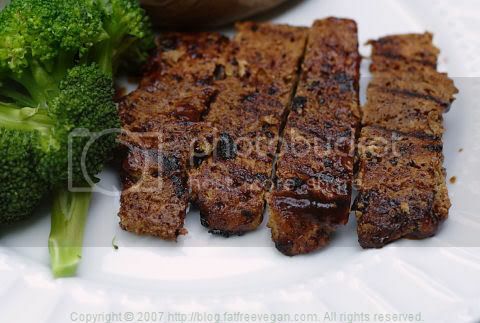 Place the barbecue sauce mixture in a wide flat dish, and place the tofu in the sauce, coating both sides well. Allow to marinate for at least two hours. Grill for 4 or 5 minutes on each side, brushing with additional sauce. Sprinkle with salt and pepper just before serving. Wash potatoes and pierce potato skin several times with a knife. 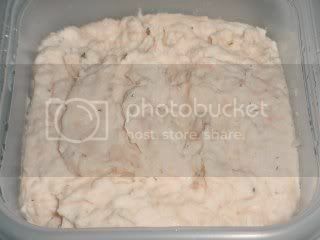 Place potatoes on paper towels and microwave on high power for 10 minutes or until soft. Cut eight 12-inch squares of heavy duty aluminum foil. Slice potatoes in half and scoop out small portion of potato to make a narrow boat, reserving the scooped out potato. Place one potato half on each foil square. Mix baked beans, peaches, onion and reserved sweet potato into a bowl and season with salt and pepper. Place mixture in potatoes. Bring up top and bottom edges of foil, leaving a little space for steam expansion during cooking. Seal potatoes in foil and place on the grill. Cook 20 minutes over indirect heat, or until warmed . Cut each squash in half widthwise. Slice 1/4 inch off the rounded end of each half so the squash sits upright without wobbling. Scrape out the seeds with a spoon and discard. Mix baked beans, barbecue sauce, maple syrup and brown sugar in small mixing bowl. Divide mixture evenly among squash halves and top each half with 1/2 tablespoon butter. (The squash can be prepared several hours ahead to this stage and refrigerated). Set up charcoal or gas grill for indirect grilling and preheat to medium. Arrange the squash halves on the grill away from the heat. Cook until squash is tender (the sides will feel soft when squeezed) and the filling is browned and bubbling for about 1 hour. Remove squash from grill and serve immediately. If using a gas grill place wood chips in smoker box or smoker pouch under the grill grate directly over the burner. Run grill on high until smoking then reduce heat to medium. If using a charcoal grill preheat to medium. Toss wood chips on coals prior to grilling. 3 heaped tbsp. Veganaise, vegan "mayo"
Add Veganaise and maple syrup. Add honey and some black pepper. Combine the margarine, salt and pepper, parsley, basil, chives and garlic until well mixed. Refrigerate for at least two hours to allow the flavors to mingle. Spread the margarine generously over each ear of corn. Wrap in aluminum foil and grill for 15 to 20 minutes, turning frequently or until done. 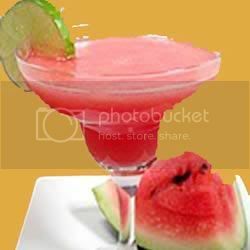 Blend ice cubes in a blender until crushed. Pour in water and juice. Blend. 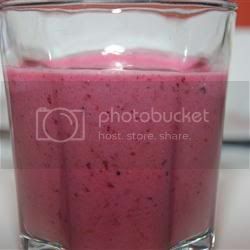 Pour in frozen berries. Blend until smooth. Pour into chilled glasses and serve immediately. Tip: If you have fresh berries to hand, of course use those. In a blender, combine all ingredients. Blend until smooth. Pour into glasses and serve. 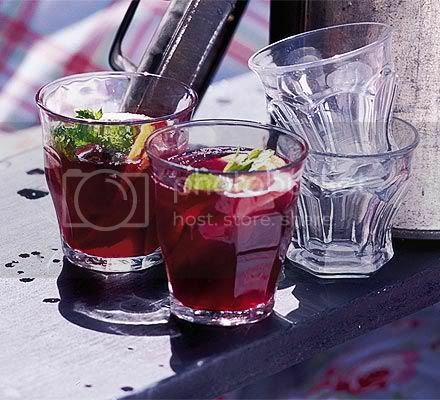 Stir together red wine and lemonade. Pour into glasses with lemon slices and sprigs of mint. 1. Cut the tempeh into 1/4 inch thick strips. It's alright if it breaks up some. 2. Heat a skillet over medium heat (medium low on a gas range) with a generous coating of olive oil. When hot, add the tempeh and stir. The tempeh will soak up the oil quickly, so continue to add oil as it fries, keeping the bottom of the pan slick. 3. The tempeh is done when both sides are golden brown and crispy, as pictured above. Turn off the heat, and add the barbecue sauce until all pieces are coated. 4. 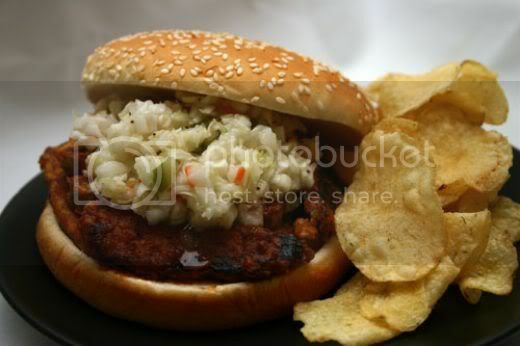 Serve the barbecued tempeh on the sesame buns and add cold slaw if you choose to use it. Serve with potato chips or a green salad. Enjoy! 1. Finely mince or crush the garlic, cut the lemon, grind the pepper, and gather all other ingredients. 2. Melt the butter over low heat, in a large saucepan. 3. When the butter is melted, add the catsup, yellow mustard, and apple cider vinegar. Mix it until smooth and evenly blended. 4. Now add the minced or crushed garlic, Worcestershire Sauce, Liquid Smoke, ground black pepper, and crushed red pepper. Firmly squeeze the juice from the 1/3 lemon. Mix it until smooth and evenly blended. 5. Now add the brown sugar and stir thoroughly. 6. Stirring constantly, gradually increase your heat until the sauce reaches a simmer. Make sure that it does not start boiling. Continue to stir constantly while the sauce simmers for ten minutes. 1. 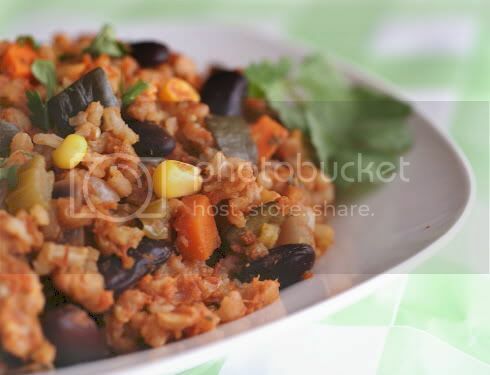 Combine all ingredients in a bowl and mix well to incorporate the flavors. 2. Set aside a portion of the sauce for dipping the seitan appetizer, and reserve the remainder to marinate the Texas Veggie Kebabs. In a medium bowl, combine all ingredients together and mix well. While grilling brush often with desired amount of sauce. In a large jar, combine the tamari, tarragon vinegar, lemon juice, olive oil, basil, thyme, cilantro, garlic, and black pepper for a marinade; shake well to mix. Place the tempeh cubes in a steamer or metal sieve over boiling water and steam for 15 minutes. 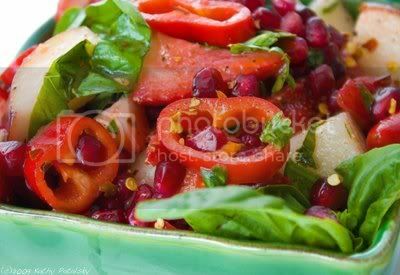 In a large bowl, combine the red pepper, green pepper, onion, zucchini, squash, mushrooms, and tomatoes. Add the tempeh cubes and marinade, and refrigerate for at least 1 hour. On four skewers, alternate the vegetables and tempeh. Grill for 5-7minutes, turning frequently and brushing with the marinade. Serve the vegetables and tempeh either on or off the skewers. 2. 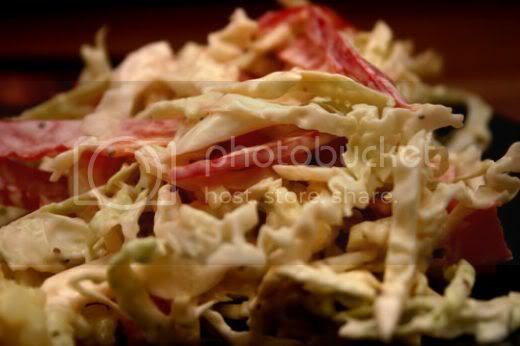 Using a very sharp knife, slice the cabbage and red bell pepper into long, very thin strips. Finely mince the onion. Grate the carrot. Cut the vegetables. 3. Put all of the dressing ingredients in a small bowl and mix well. 5. In a medium-sized serving bowl, place all of the vegetables. Pour the dressing over them, and mix well. 6. Cover the slaw and let it sit in the fridge for at least one hour so that all of the flavors blend well. 7. 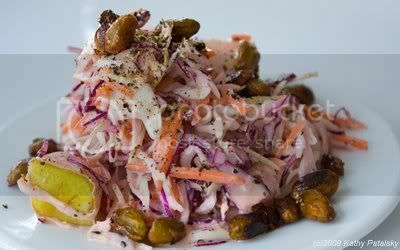 After the slaw has chilled for at least an hour, serve it with an appropriate main course. 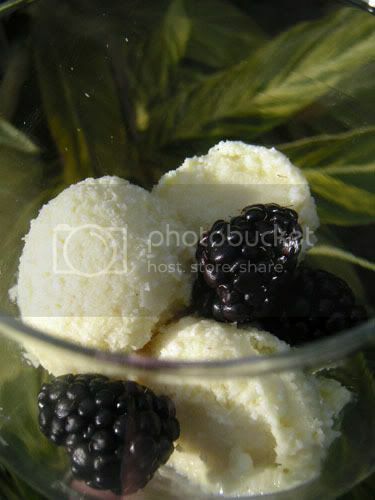 In a food processor blend all ingredients until smooth. Heat a few tablespoons of veggie broth in a medium sized pan. Add onions and cook for about 5 minutes. Add garlic, mushrooms and seasoning (and more veggie broth if needed), and cook until the mushrooms are soft. 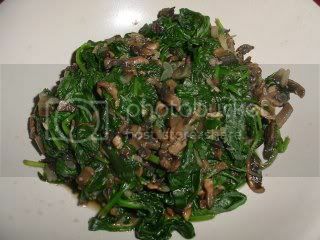 Add the spinach in batches, covering with a lid if necessary to wilt. 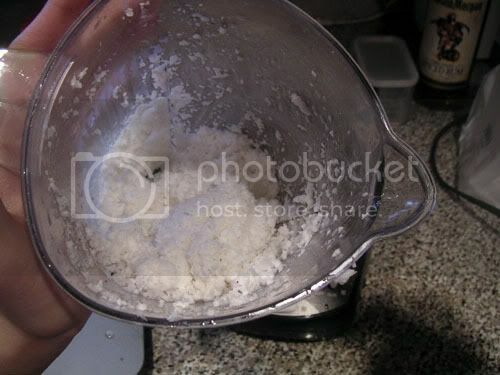 Drain any excess liquid before transferring to a bowl. 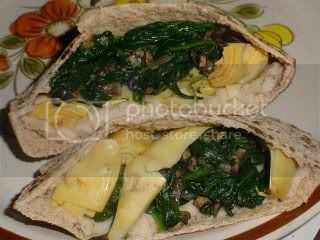 Spread a thin layer of the puréed white beans, a few spoonfuls of the mushroom/spinach mixture, and a few artichoke hearts. Note: This makes more than enough for a meal for two, so we will be having the leftovers for lunch. We dipped these in Annie's Tuscany Italian dressing. Idea for a variation: This would probably be good with a little more garlic and/or some kalamata olives puréed with the beans. This would also be really good with plain or garlicky hummus instead of the white bean purée. By Diet, Dessert and Dogs : ) -Makes 6-8 servings. May be frozen. Spray a large casserole dish (one with a cover) and set aside. 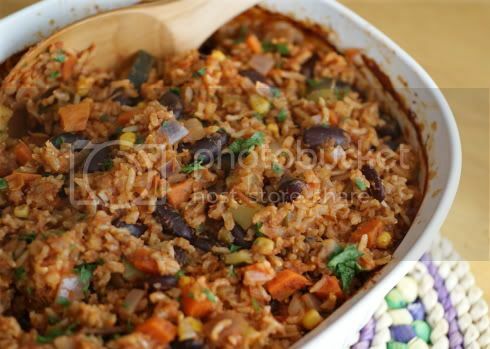 In a fairly large, heavy-bottomed pot, heat the rice, onion, garlic, carrots, celery, jalapeno, cumin, coriander and chili powder over medium heat, stirring constantly, for about 5 minutes, until lightly browned. Add the salt, stock, bay leaf and tomatoes, and stir to combine. Cover, lower heat and simmer for 15 minutes. Add the beans, corn, parsley and cilantro. Turn the mixture into the casserole dish, cover and bake for another 30-40 minutes, until the liquid is absorbed and the rice is cooked. If necessary, add a bit more stock and continue cooking until the rice is sufficientlysoft. Garnish with more chopped herbs, if desired. Note: The original recipe suggests cooking the entire dish in your pot on the stovetop. I found, however, that the rice never really absorbed the liquid that way, and it remained hard even after an hour of simmering. If the stovetop method works for you, however, go ahead and use it – you’ll save yourself some dishes to wash that way. Dr David Kelly - Murder Or Suicide?